In spite of its larger size, Amazon's Kindle DX comes off as a surprisingly lean and elegant contender in the current e-book reader steeplechase. This enlarged version of the Kindle has a number of appealing features (including strong PDF support) along with a few missteps. 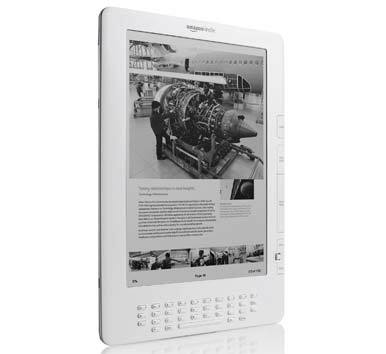 Dominating the front of the Kindle DX is its 9.7-inch,16-grayscale E Ink display. The device measures 10.4 by 7.2 by 0.38 inches and weighs 18.9 ounces. The Kindle DX has a keyboard, but it's awkward to type on. In my hands-on examination of the device, I came to appreciate many aspects of its design. Still, some roadblocks ahead could impede its widespread adoption. The most problematic of these are the reader's price and the fact that early newspapers available for the Kindle DX lack the visual design and appeal of physical newspapers. The Kindle DX has a minimalist design. The only port on the bottom is the unit's Micro-USB 2.0 connection. The reader charges via Micro-USB, but the charging cable detaches from the outlet plug, so you can plug it into your computer's USB port for data transfers as well. Direct-to-Kindle data transfers are more important with the Kindle DX, due to its PDF reader: PDFs of large, image-heavy documents can eat up 10MB, 20MB, or more. Since Amazon now charges 15 cents per megabyte for data you e-mail to yourself over the Kindle's Whispernet service, fees could add up quickly if you're an avid viewer of PDFs. The top of the Kindle DX houses a power slider switch and a 3.5mm headphone jack. The Kindle DX has text-to-speech reading capabilities for handling content whose producers permit it. The Kindle DX has built-in stereo speakers. The other big enhancement (mentioned earlier) is the Kindle DX's native PDF reader, enabling Amazon to target the professional market, where financial documents, reports, marketing flyers, and even PowerPoint presentations are commonly published as PDFs. Of course, the Kindle DX also opens wide opportunities for textbooks and such highly formatted books as cookbooks and profusely illustrated books). In addition, newspaper and magazine publishers will have the opportunity to deliver targeted, customized content that takes advantage of this platform. At $489, the Kindle DX will make consumers think hard before buying one. But it is also a very capable device that can benefit from a broadened scope. The more multipurpose Kindles can become without detracting from or minimizing their primary mission as electronic readers, the better-positioned they will be going forward. Poky performance issues prevent us from making an unqualified recommendation of this e-book reader.